So helpful to be able to talk with Anna in more depth about my situation - she clarified several things I was wondering about and fully explained the circumstances and my best course of action. Wonderfully helpful, positive, and empowering - thanks so much! Good. Gets information directly from your guides. Accurate with everything I could know at this time. So great connecting with Anna! She's quick to connect, detailed, and right on target with my situation. Looking forward to things unfolding! Thank you! Psychic Medium,Spiritual Teacher,Clairvoyant,Author, Energy Practitioner. 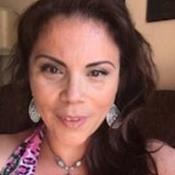 Anna has been a naturally gifted Psychic Medium & Spiritual Teacher for nearly 25 years. She talks directly to your Angels and Guides. She is uncannily accurate with names, dates, details in her readings. Listed #11 for the 2014-2015 as The Best Metaphysical Teacher in the World out of 800,000 fellow colleagues. Born with the gift of sight, Anna also posses the ability to connect to the 'other side' as a medium. As a little girl, she recognized that she had special abilities; however, she did not fully comprehend her gifts as a psychic medium. She was unaware that she was communicating with Angels. She would have visions and receive messages for others. As the years passed, she began to have encounters with psychic phenomena. During this time, as a young adult, she offered psychic readings for friends and family. This further propelled her gift and enabled her to hone her craft to become validated in her work today. Anna is different from other psychics because through her teachings she gives her clients the tools to lead a better life. She will teach you how to manifest your true desires with simple and effective techniques. Anna empowers you by giving you accurate psychic readings including names, dates, and descriptions of your true soul mate and spiritual path. Her healings are done through loving Universal Energy. God has given her great gifts that she wants to share with you to help you to be happy in life. Today, Anna is doing her life's work and true calling - attracting wonderful people into her life. She manifested a loving happy marriage, financial success and true inner peace. She wants you to be as happy and fulfilled as she is in her life. Read her message about fulfilling your dreams through God love that resides within you. Hit the button below to talk to Anna now! Psychic Medium Anna has been a user of Keen since 2001. Getting Love & Relationships advice from Psychic Medium Anna through www.keen.com is safe, secure and confidential.